It was time to take a little break from the Rainbow Strip Quilt, which is currently in limbo while I wait for the new quilt labels I designed and ordered from Spoonflower. My sewing machine has been growing dust lately while I finish my web design course and get ready for someone’s second birthday. 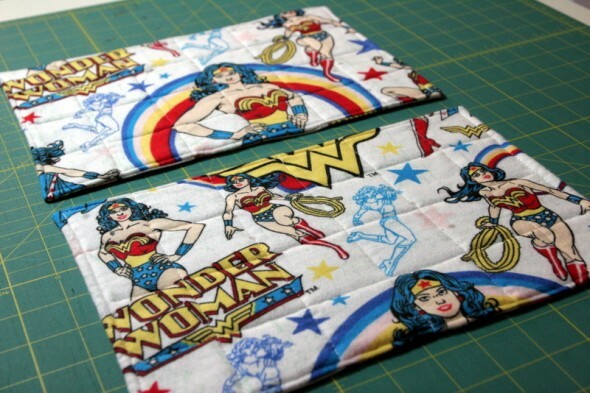 I ordered some Wonder Woman fabric from Spoonflower recently, and I used some of it to make these mug rugs for a friend (and huge Wonder Woman fan). I love sending mail surprises to people. This print was a flannel that I found on eBay, which I used for the backing. I kind of love these. I cut 2.5″ squares out of my 2 Wonder Woman prints and some white Kona cotton I had. 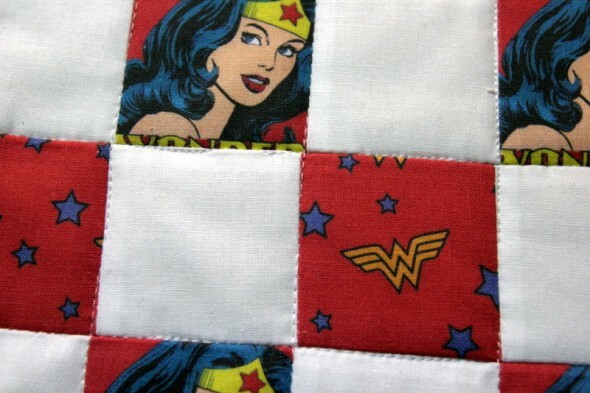 I quilted these by stitching in the ditch. If I’d had more time to get these made I’d have bound them properly, but instead I sewed them right sides together and turned them right side out. I actually only sewed 3 sides closed, then I turned them and topstitched those same three sides. 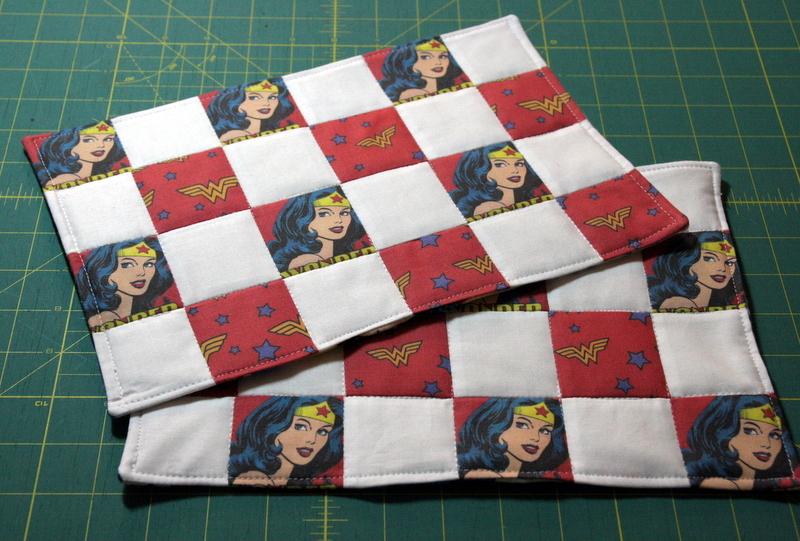 I did the horizontal quilting before I got to the bottom of each mug rug. 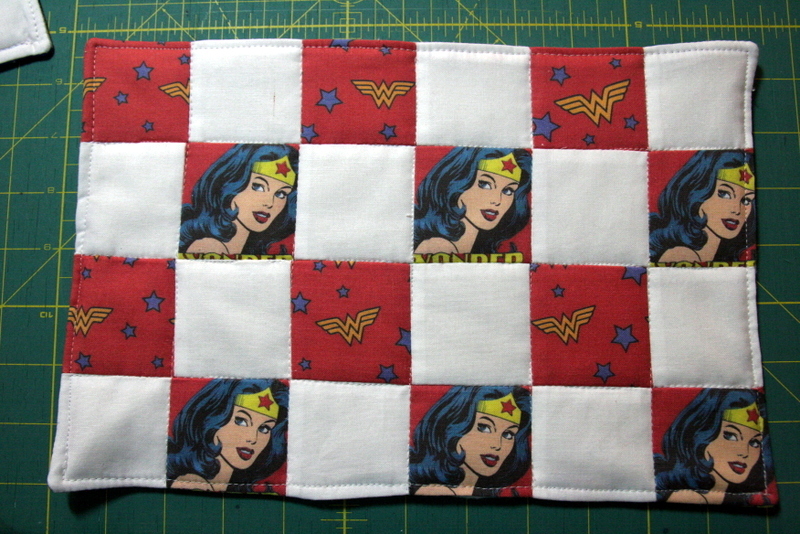 Then I sewed the bottom opening closed by topstitching that side, and then I did the vertical quilting. Not too bad, I like these.